The 8th National Conference of Chinese Cereals and Oils Association (CCOA) and the 9th Annual Academic Conference were held in Beijing International Convention Center. The award ceremony was held at the opening ceremony and Myande won four awards. “Key Technologies and Applications of Development and Utilization of Fermented Feed Industrialization” jointly submitted by Myande Group and Academy of State Administration of Grain won the first prize of Science and Technology of CCOA. 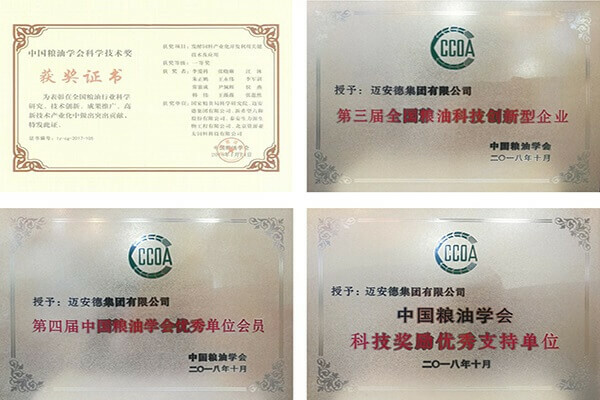 In 2017, “Appropriate Processing Technology of Edible Oil and Development & Application of Large-scale Intelligent Equipment” submitted by Myande Group was awarded “Special Award of Science and Technology of CCOA”. The theme of the conference was “Technology Leads Economic Development of Grain Industry”. Speeches made by participants in the conference focused on innovation and development of edible oil and feed industry, the innovation and development of grain circulation industry chain, and the innovation and development of grain and oil products technology.